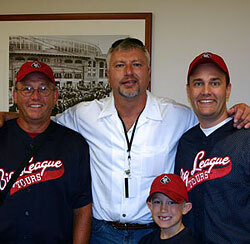 and Ron Kittle at US Cellular Field. Ever since I was a boy playing little league baseball, I've had a dream to visit all of the Major League Baseball stadiums. Like most things in life, that dream never became reality. Until now. As I began searching for ways to visit all these stadiums, it occurred to me that someone should provide sports travel packages for busy people like you and me that included more than just the bus trips and ball games. They should also include some cool stuff you can't typically do on your own, like a baseball stadium tour or a visit to the Baseball Hall of Fame. That's why I've launched Big League Tours, a sports tour company that not only takes care of the busses and games for a baseball tour but also provides all the cool stuff for a true sports vacation. On a Big League Tour, we'll hang out with Major League ballplayers, get out on the field and inside the dugouts, and even score special access for stadium tours and batting practices. You know . . . the cool stuff.